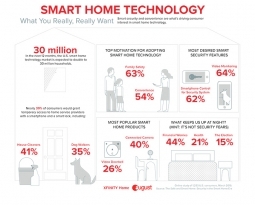 August Home and Xfinity Home released the results of a new study, The Safe & Smart Home: Security in the Smart Home Era, which uncovers what people really want as they embrace smart home technology. The study, sheds new light on what motivates adoption, what features are most compelling, as well as how consumers plan to use smart home technology. The connected home is on the rise, with nearly 30 million U.S. households* projected to add smart home technology in the next 12 months. 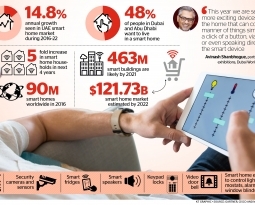 The products consumers are most excited about adding to their homes include connected cameras (40%), video doorbells (26%), connected light bulbs (19%) and smart locks (13%). And, it’s not a coincidence that these top picks are security-focused, as 63% cite family safety as the biggest motivator for adopting smart home technology. A a close second, consumers are adopting smart home technology to simplify their lives with greater convenience (54%). The adoption of new smart home products is delivering a new approach to home security and providing consumers with new ways to manage their busy lives. One way is by using a smart lock and smartphone to control access to the front door for home service providers. Fifty-seven percent of respondents indicated they are open to the idea of letting service professionals into their homes remotely with a smartphone such as house cleaners (41%) and dog walkers (35%). For more information you can view The Safe & Smart Home infographic and The Safe & Smart Home report. *U.S. Bureau of the Census for 2015 indicates there were 124,600,000 households. **The data referenced in this report come from a study commissioned by August Home and Xfinity Home, produced by research firm NextMarket Insights and conducted as an online survey among a total of 1,293 U.S. consumers.